The title of this post may be a little misleading, because we’re actually going to start with the “why” and move on to the “how” as we go. 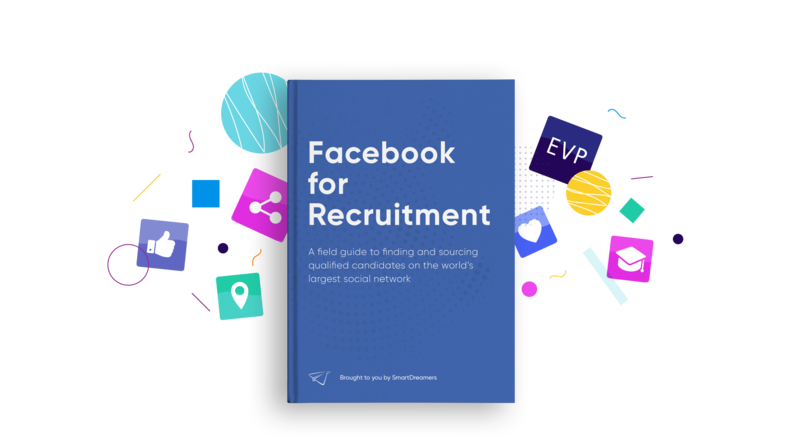 But it is an important question: given all of the possible venues for sourcing candidates in modern recruitment, why use Facebook? Of course, there’s the elephant in the room. Or, rather, the billion monthly active elephants. Not only does Facebook boast more than a quarter of the entire world’s population as registered users, it lays claim to a shocking amount of our collective time. In the United States, the average person spends 40 minutes a day on Facebook. Around the world, Facebook processes more than 4 million status updates, images, and comments every minute. Of course, it’s not just the shear volume of users and activity that make Facebook a worthwhile destination for sourcing job candidates. Rather, it’s their ads platform, and all of the features and options that it gives users for targeting, placing, and optimizing their messaging. Yes, the demographic targeting is extremely granular (meaning that recruiters can easily target individuals with very particular skills or interests within a short radius of their offices), but it also allows users to target potential candidates from their own existing contact lists, and, taking it one step further, will help you to create “lookalike” audiences that match many of the characteristics of your existing contacts. In addition to these targeting options, Facebook gives advertisers the choice to run a “remarketing” campaign, which displays your content specifically to users who have visited your website or engaged with your brand on Facebook previously. In traditional sales, this has proven to be an effective method of moving potential customers through the buyer’s journey more quickly. When it comes to recruitment marketing, it can be just as useful. By targeting potential applicants who have already shown that they have some interest in and familiarity with your employer brand, you further establish yourself in their minds as potential employment destination. As these users continue to encounter your brand after that first touch, your employer value proposition (EVP) becomes more firmly associated with your company and even passive job seekers (who comprise 80% of the job market) will begin to envision themselves working at your company. There are other types as well, but these are some of the most important for recruiters. Each one gives companies a different option for telling a story in pictures, videos, and text about their employer brand. As you sketch out your Facebook recruitment marketing strategy and goals (more on that in a minute), you can begin to get a sense of what type of ad format might be appropriate to those goals. If, for instance, you’re targeting multiple job types to the same basic demographic, a carousel ad might enable you to let your audience self-select the appropriate position for their respective interests or experience levels. If you’re specifically targeting mobile users (a tactic that might be efficacious if you’re trying to reach more millennials), a canvas ad might be the ideal format. Each of these formats will have different technical specifications, but in general your ad is going to consist of visual assets plus a headline, a short body of text, and a link with a short link description. For photo and video ads, you’ll have 125 characters to describe your position or spread your employment branding, plus a 25 character headline and a 30 character link description. For carousel ads, it’s a 40 character headline and a 20 character link description. Hold on—are employer ads really the be-all and end-all of employer branding on Facebook? Of course not! Any successful recruitment campaign using this platform should be grounded in an existing Facebook presence (involving, ideally, both a corporate page and careers page, with distinct and regular content coming from each) that highlights the unique aspects that make your company a desirable place to work. That said, the era of dependable organic Facebook reach has been over for some time now. Like it or not, the only way to get your content in front of your audience in a reliable way is to leverage at least a small ads budget. But don’t despair! A little can go a long way in terms of supporting your larger employer branding efforts. So, how should Facebook connect to your broader attempts at candidate sourcing and positioning your business as an employment destination? Essentially, your Facebook careers page (separate from your customer-facing page) should be a place where you can highlight your EVP through links, pictures, videos, and other content that relates to your employer brand. It can also serves as a means of communication with potential future applicants, who can reach out to you via comments and direct messages and with whom you can communicate proactively in a way that provides value and builds trust. This represents an opportunity to foster a sense of community that mimics the community you aspire to provide in your business environments. There are some others, but these will be the most relevant for recruitment purposes. This is where the alignment between your goals and your efforts becomes crucial. You can lower your cost-per-click on Facebook’s platform by promoting content with a high relevance score relative to the interests of your targeted audience. By choosing the right goal, the right audience, and the right distillation of your employer brand and EVP, you can increase the relevance of your post and thereby decrease your cost-per-click. Obviously, there’s plenty more nuance, both technical and philosophical, to get into here (and we won’t shy away from getting into it in future blog posts), but the basic upshot is this: if you’re able to develop a strong EVP and an authentic employer brand that projects your corporate mission, strengths, and values, Facebook can be one of the most valuable (if complex) tools in your recruitment arsenal.